Although there have been a lot of short-term distractions, the contradictory underlying trends facing the Treasury market have been stable for the past few years. At the time of writing, it seems likely that “tapering” will occur this month, although I see this as relatively unimportant and priced in. From a rates expectations perspective, only the timing of the first Fed rate hike matters. That timing will be determined by labour market trends, which will be updated this Friday. The debate over the timing may be summarised as the battle of the two straight-line extrapolations below. UPDATE (2013-09-06): The latest data confirmed the triumph of the straight line projections. If one uses the highly sophisticated modelling technique of drawing a straight line through the data since January 2010 (the month when the employment ratio finally stabilised), we see that the unemployment rate is projected to fall at 0.72%/per year, while the employment ratio trend is essentially a flat line, only rising at 0.06% per year (however it has seen an improving trend over more recent data)*. The simplistic model projection for the unemployment rate for this Friday is between 7.22% - 7.43% (95% confidence interval, latest was 7.4%). The relatively close fits of these straight line projections on a multi-year period indicates that they are reflective of the automatic stabilisers within the economy. Although many focus on the automatic stabilisers during a recession, they also act to reduce too-rapid growth during the expansion phase of the cycle. The U.S. economy appears to be locked into a relatively slow and steady growth path. I cannot see anything big enough to knock the economy off of this path, although there are candidates – the Gallup-ing alternative unemployment rate, emerging market instability. With a 10-year yield near 3%, it appears that the market would be roughly pricing in hikes starting around early 2015. Excess capacity in the labour market is steadily disappearing. Trend will hit 6.5% in October 2014 data, implying the need for rate hikes before 2015. The falling unemployment rate is an artifact of the falling participation rate. Unemployed will be drawn back into labour force. 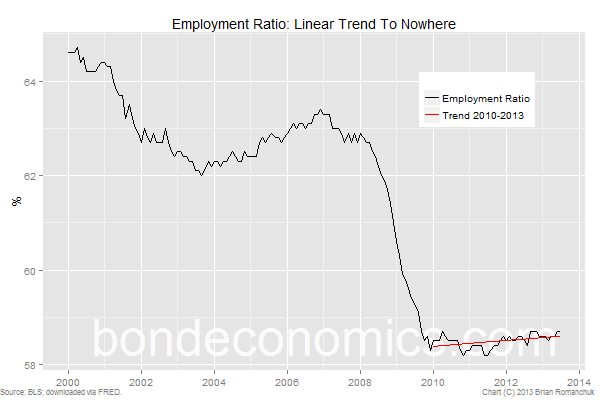 The employment ratio has been long expected to fall as result of demographics. The lack of a sustained rise in the employment rate indicates how weak the labour market really is. Demographics cannot completely explain the data. There are geographic and skills mismatches between job openings and the unemployed. The Fed needs to target the broad aggregate numbers. Inflation is low, but steady. Prices are very sticky at 0% inflation. For example, it is difficult to cut pay. I have some sympathy towards the dovish side of these arguments. This is largely based on an intuitive argument: it will be harder and harder for the participation rate to fall as the unemployment rate grinds lower. There is always a considerable churn of employment, and the employees who have just become recently unemployed are less likely to drop out of the labour force than those that lost their job during the worst of the recession, when there was little hope of finding a job. The data over the coming six months should provide a better indication on that score. 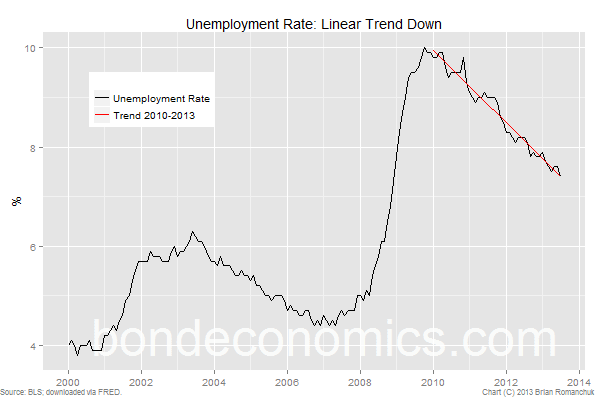 * It may appear that a falling unemployment rate contradicts an unchanged employment rate. This is not a contradiction, as in order to be considered to be unemployed, you have to meet the tests to be considered to be participating in the labour market. The participation rate in the United States has been falling since 2010, and this largely explains why the unemployment rate is dropping.